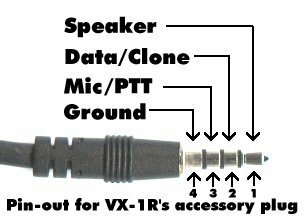 Later versions of the VX-1R will allow you to do a "cross-band operation" ( NOT REPEAT ). I have the ver. A105. I have tried this on earlier versions of the VX-1R and it will not work. AMDS note…the early version of the software ver. 1.01 shows those memory channels in a funny way, it cannot figure out which band you are in when looking at the memory file (a UHF freq. with a VHF tx). It has not effected the operation of the software. The AMDS ver 1.03 does not have a problem with the operation below and shows up correct in the memory file. I have several channels on the VX-1R allocated to store a VHF memory channel with a UHF TX freq. to crossband back to the CAR to get on a local 2M repeater. Here is how I set it up. I place my mobile dual-band radio in the CAR to crossband ONE-WAY, because most of the time I can hear the local repeater, but I can't hear me. I set the CAR dual-bander up to receive the UHF simplex frequency ie..446.00 (with PL CTCSS on so every noise does not key up the crossband operation). Then I set it up on the 2M VFO side for the repeater INPUT frequency. I turn the car radio to 5 watts out and turn on the crossband to go UHF to VHF. The car radio only transmits when you are talking. And there you are, you don't have to wait until the squelch tail drops and you can join in with the best of them. Independent Tx-Rx Frequency Storage ("Odd Splits"). You may need to use a repeater that has a non-standard shift (an Offset that does not conform to the local repeater band plan). The VX-lR allows you to store the transmit and receive frequencies independently into a single memory; so you can store the non-standard repeater's settings without having to change the "standard" repeater shifts in your VX-1R (+/-600 khz, +/-5 MHz, etc.). Be sure the transceiver is in the VFO mode. Press [MV] once to change to VFO operation, if necessary. Turn the Dial to the desired receive frequency. Then, as with "Simple Memory Storage" previously, set up all needed CTCSS/DCS tones and modes, but eliminate any repeater shift (+ or -icon) which might be set. Hold [FW] for 1 second so the "F" icon blinks and a memory number appears above the frequency dis-play. The next step must be done within 5 seconds while "F" is blinking. Now turn the Dial to the desired transmit frequency. ** At this point change bands, if you have stored a 2m receive frequency, push the [BAND] until you get to UHF ham VFO mode and enter a simplex UHF freq. (446.000 or whatever, NO OFFSET) This process you can also store a 2m simplex TX on a UHF repeater frequency. Again hold [FW] for 1 second so the "F" icon blinks and a memory number appears, and turn the Dial to select the same memory you stored the receive frequency in, which will be blinking. The next step also must be done within 5 seconds while "F" is blinking. Hold the [PTT] switch while pressing [FW] momentarily. During memory storage, pressing the [PTT] switch does not cause transmission; rather, it signals the radio's microprocessor that a transmit frequency is being stored. Memory storage is now complete. When you recall a memory containing independent Tx/Rx data per this section, you will notice that the repeater offset is shown as "-+", indicating that the pre-programmed default offset is not in use. The abbreviation NC means no connection. The DB9 connector can be Radio Shack part # 276-1538 or equivalent. A good place to start looking for the 4 conductor plug is Tower Electronics: 1-800-662-3422. The 2N2222 can be substituted for any general purpose NPN transistor, while the 2N3906 can also be substituted for any general purpose PNP transistor. D1,3,4 are general purpose silicon diodes. D2 is any 5.1V zener diode. All resistors are 1/4 or 1/8watt - 5% tolerence resistors. This PC programming cable can also be built with SMT (Surface Mount Technology) parts if desired. 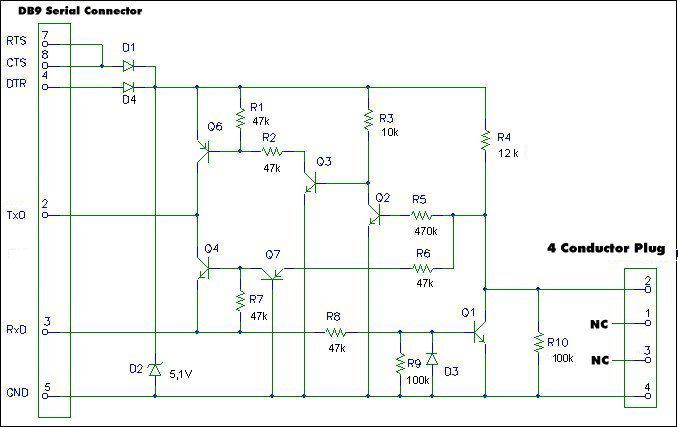 The interface is a bidirectional level converter, changing TTL-level to RS232, and vice versa. The supply voltage comes from RTS, CTS and DTR and is stabilized with D2 to 5V. Q1 works as a simple switch, getting the data viz R8 from the PC. In the opposite way Q2 drives the push pull stage Q6 and Q4. This cable works with the Yaesu FT-50, VX-1R, VX-5R. The cable can also be adapted to work with the FT-10 & FT-40 - which use a 3 conductor programming cable.